Since its release in 2008, Dungeons & Dragons 4th Edition has come under a lot of fire from seasoned D&D players who dislike many of the changes the new edition has made to the three-decades-old rules set. Yet others have defended D&D 4e as a necessary re-invention to keep an old game up to pace with current times, and one of the designers has claimed D&D 4e is better for classic gaming than its immediate predecessor, D&D 3.5. The Escapist was excited to sit down with Andy Collins and Liz Schuh from Wizards of the Coast to talk about the real strategy behind Dungeons & Dragons 4th Edition. Andy Collins manages the design and development of 4th edition and was also on the team for 3.5, while Liz Schuh is WoTC's brand director and oversees all D&D products from novels to games and miniatures. On The Escapist side of the table is Publisher and old-school D&D aficionado Alexander Macris, along with Games Editor Greg Tito. Here follows Part Two of our Exclusive Interview, wherein we discover what's in 4th edition for old school gamers and what Wizards' really thinks about Pathfinder. For Part One of our interview, click here. GT: A lot of old school players have a really strong affinity for the world of Greyhawk. Can you talk a little about the decision to move from Greyhawk to living Forgotten Realms? AC: We wanted to try something new. The living Greyhawk, there's nothing wrong with it, it had a great run, it was a very successful program. But we felt it was a good time to showcase a different part of the D&D portfolio, to give people a little different experience rather than continuing to run people through same-old-same-old. Dungeons and Dragons has an awful lot of compelling worlds out there. We can feature all of them, fully, at the same time so instead we think it's more advantageous for us to pick and choose the time for those. Greyhawk isn't in circulation right now but it's not gone anywhere, we've still got it. AM: There's been this return to classic D&D in the blogosphere. Do you guys see the old school renaissance as a good or bad thing for 4th edition D&D? AC: I think anything that has people thinking about D&D, talking about D&D, playing D&D is a good thing. There are an awful lot of those old school experiments that lead to, "Well how would I do this with the new rule set? Or how would I use the new character archetypes in these older adventures?" I know that I ran a whole 4th edition playtest that lasted 6 or 8 months with my home group and all I did was pillage 1st and 2nd edition adventures. AM: I pillage old adventures all the time. AC: Great stories are great stories no matter what the names of the classes of the characters are that are adventuring or what rules are supporting them. 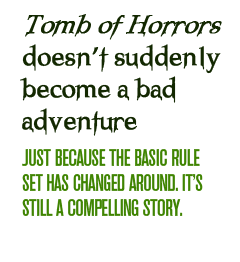 Tomb of Horrors doesn't suddenly become a bad adventure just because the basic rule set has changed around. It's still a compelling story - at least for the DM, some of the players may differ.